Boasting superior tree stand technology, the L110 from Millennium Treestands is a ladder-type product that offers hunters an effective means to survey the hunting site and be able to make the catch of the season. This tree stand comes with everything you need to enhance your hunting experience, and these are precisely the reasons why. This impressive tree stand comes with a comfortable tight sling seat that boasts the patented comfortMAX technology to make it one of the most comfortable tree stand seats in the industry. The seat comes with a revolutionary, lightweight polytec construction that lets you enjoy comfort on the tree stand. It is covered in durable, stretch-free fabric that will not absorb scent or water so you can use it without the deer sensing that you’re way up there waiting. The fabric also ensures that the seat is quiet to the touch, so no sudden noise will startle your prey when you get up and take aim. The non-stretch quality ensures that the cover retains its shape through many hunting seasons. The seat folds back so you can have a better standing shot with your bow or hunting rifle. Both the arm rests and the shooting rail are adjustable so you get the height suitable for you. They are also padded and work really well with the folding footrest to provide comfort while waiting for the deer. The tree stand has a strong welded steel construction that delivers more than enough support and stability so you can rely on the product for your hunting application. The welded steel construction ensures that structural elements can take loads more effectively while giving the entire tree stand a smooth and seamless look. The tree stand has a powder coat finish that lasts much longer than standard paint and is more durable because of its resilience against chipping and corrosion. The rigid double rail ladder offers additional stability and support to the user for a secure and firm hand grip while going up or down. The rigid ladder is designed not to require a brace as it is already strong enough on its own. This tree stand includes an adjustable tree brace to keep it securely in place against the tree so you are safe high up in the platform. The adjustability lets you select any tree to put the ladder stand against, so you aren’t stuck with just one tree throughout the hunting season. The stabilizing strap helps tether the tree stand to the trunk of the tree, ensuring that it is anchored firmly so the structure does not wobble or feel unstable. The double size platform gives you all the room you need to move around in safety as you wait for the perfect opportunity to shoot. It measures a generous 20 inches wide and 32 inches deep for all the room you need. The shooting rail lets you position your weapon safely on something solid and not shaky. 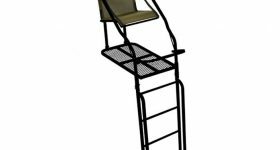 This tree stand supports up to 300 pounds, making it a great unit even for hunters with heavier builds. The seat measures 20 inches wide and 17 inches deep so you can sit safely without falling off. The ladder sleeves easily line up for effortless and safe use. Shipped to you with a dependable three-year limited warranty, this tree stand provides impressive transportability thanks to its lightweight aluminum construction. It minimizes weight without sacrificing stability and stiffness. Designed to be quiet, this tree stand is perfect for the stealth requirements in hunting, even in the most extreme conditions. 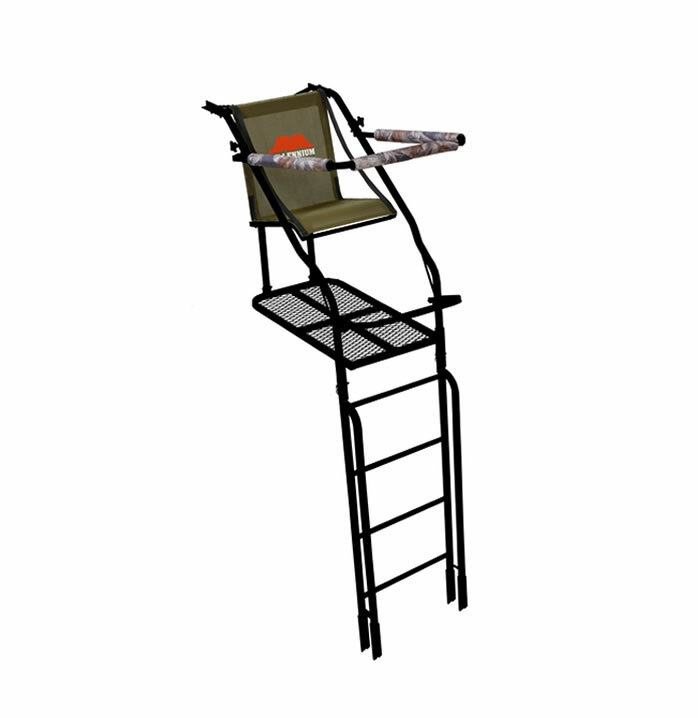 Easy to set up, this tree stand has a fold flat design that makes it easy to pack and store. Both the platform and the seat level out independently to suit multiple angles of position in seconds while eliminating the need to use tools for that purpose. Take standing shots effortlessly and confidently with your bow or gun thanks to the seat that folds back without noise and effort. You can customize the height of the tree stand from 8 feet to 21 feet off the ground to suit your needs.